Lately I have been finding that I am pushed for time in the evenings, as a result I have been resorting to meals that can be prepped and on the table in 20 minutes without too much fuss. The recipe below fits the bill perfectly as in the time that it takes to steam the rice the rest of the dish can be cooked. This ‘sticky beef’ recipe uses dates to make sauce, giving it a wonderfully sweet caramelised flavour. The spice and warmth from the chilli helps cut through the sweetness of the dish, however if you find it too sugary for your palette then add 1 tbsp of light soy sauce to the dish at the end. By stir-frying the vegetables quickly they will retain a slight crunch which contrasts the smoothness of the sauce and tenderness steak. Don’t feel that you have to use beef to make this recipe, it would work just as well with pork or chicken thighs cut into thin strips and cooked in a little oil before adding it to the sauce. Enjoy! This entry was posted in beef, fruit, main meal, quick & easy and tagged eatclean, food, foodblogger, foodphotography, foodstagram, foodstyling, healthyeating, homecooking, instayum, recipes on September 16, 2016 by Antonia Cooks. I told my Spanish friend Alejandro that I was going to make Gazpacho this week and he quizzed me about what I intended to put in it to ensure that I was making what he deemed to be an authentic Spanish Gazpacho. When I dropped ‘lemons’ into the list of ingredients that I intended to use, he promptly stopped me and told me in no uncertain terms that lemon is not a Gazpacho ingredient and that the vinegar is all that you need – and I have to say that now having made it without lemons that I agree with him. For those of you that are less familiar with Gazpacho it is a cold tomato soup made using raw ingredients and there is absolutely no cooking involved. All you need to make it is a sharp knife and a hand blender – simple. Whilst summer is drawing to a close this is a great option if you are looking for a refreshing starter or light lunch. The underlying flavours are both tangy and slightly creamy making you want to go back for more. Enjoy! This entry was posted in quick & easy, soup, tomato, vegetarian and tagged food, foodblogger, foodphotography, foodstyling, homecooking, recipes, seasonalfood on September 2, 2016 by Antonia Cooks. This recipe below is a little gem and is very easy to make. The longest part of the whole process is waiting for the cake to cook and cool. So if time is tight I would suggest making the cake the day before and leaving to cool overnight. Whilst I have suggested that you use nectarines and pomegranate seeds for the topping, many other fruits would work just as well. As the sponge is made using ground almonds it will mean that the cake once cooked will be quite dense and moist. So don’t worry about the cake not rising, it isn’t meant to. The mascarpone cream makes this pudding wonderfully rich and silky and fruit not only acts as the decoration but gives the just enough acidity to prevent this pudding becoming too sweet. Enjoy! This entry was posted in baking, pudding, recipes and tagged food, foodblogger, foodphotography, foodstyling, glutenfree, instayum, recipes on August 12, 2016 by Antonia Cooks. Last year I bought a couple of new “toys” for my kitchen, namely, a food processor and a slow cooker and they have been invaluable! 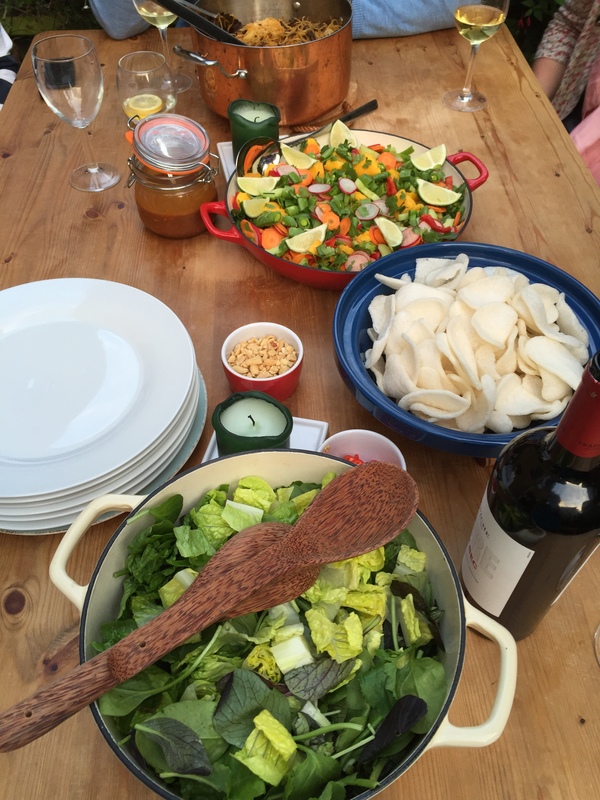 I mentioned in my last blog that I have been throwing a number of dinner parties recently and half of the meals that I have been making really would not have been possible if I did not have these two appliances for a mid-week dinner party. I use my slow cooked to make all manner of things, ranging from pulled pork, rice pudding, tagine, curry and stews. 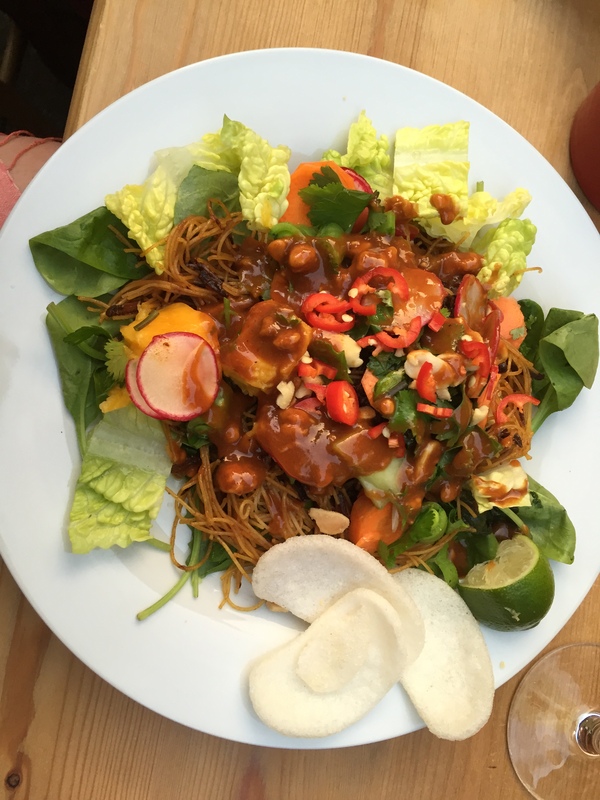 I suspect you are thinking that these are really winter dishes and to an extent you are right, but there really are some lovely summer dishes that you can make in your slow cooker, for example this Thai Beef Salad. I use my food processor to make anything from, hummus, cakes, pastry, coleslaw, focaccia to mackerel pate. Yes I admit it is a pain to wash up but it saves me masses of time in terms of preparation. If you can afford to get one and have space in your kitchen to it is a worthwhile investment! I am a huge fan of Vietnamese and Thai food and their fresh and fragrant flavours. This salad is a flavour explosion and has so many things going on at any one time ranging from sharp, spicy and sweet, to tangy, smoky and cool. The key to this meal is in the preparation and forward planning, I cook the meat overnight, so that it may cool whilst I am at work during the day. The dressing can be made in advance as it will keep over several days and will just need to be shaken up just before serving. Then it is simply a case of preparing the salads, which if you can use a food processor really takes no time at all. It may look like a lot of effort to make this salad, however, I cannot recommend it enough. Place the beef and all the ingredients for the marinade into a slow cooker. Put the slow cooker on a low setting and cook for around 6-10 hours stirring occasionally. You will know that the beef is ready when it is slightly caramelised and falls apart when you use two forks to shred it. When you are happy that the beef is cooked, remove from the slow cooker and place in a bowl, drizzle over some more honey and soy sauce (roughly 3tbsp of each) stir thoroughly and leave to cool completely. Prepare the salads if you have a food processor use it to slice all of the vegetables finely. 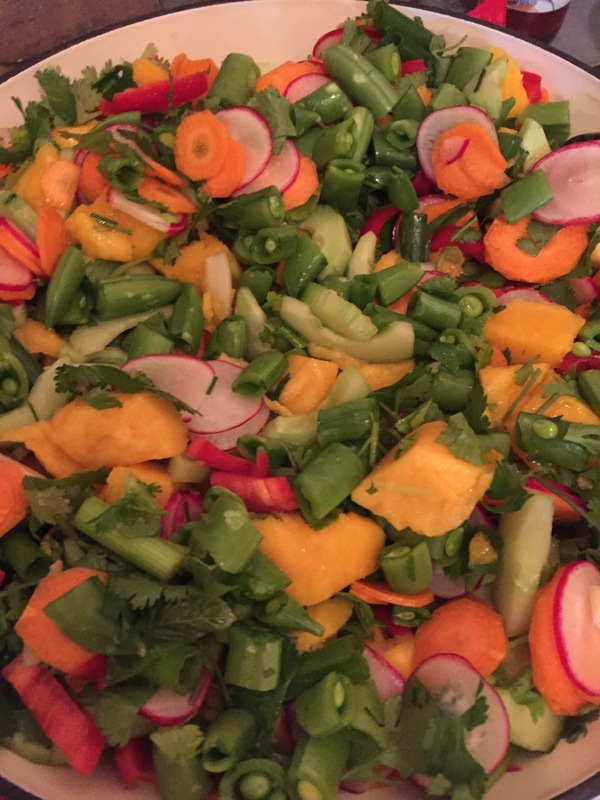 In a large bowl combine the, carrots, radishes, cucumber, sugar snap peas, mango, sweet red pepper, mint, chives and coriander. Garnish with the lime wedges. In another bowl mix together the green salad of the Romaine Lettuce and the mixed leaves. In a large jam jar shake together the dressing ingredients until they are completely combined. Add more soy sauce, Hoisin sauce or lime juice as required according to your own tastes. Just before you are ready to serve, shred the beef with two forks. To serve place some of the green salad on a plate. Add a spoonful or two of the mixed salad. Top with some of the beef noodles. Pour over a little dressing and add the chilli and peanuts according to your own tastes. Serve with some prawn crackers. This entry was posted in beef, fruit, recipes, salad, slow cooking and tagged eatclean, foodblogger, foodie, foodphotography, foodstyling, healthyeating, homecooking, recipes on June 30, 2015 by Antonia Cooks.